In 1861 at Oshoro, southwestern Hokkaido, a party of herring fishermen, migrants from Honshu, were laying the foundation for a fishing port when they saw taking shape beneath their shovels a mysterious spectacle - a broad circular arrangement of large rocks, strikingly symmetrical, evidently man-made. What could it be? An Ainu fortress? They would have been astonished to learn, as in fact they never did, that the Oshoro Stone Circle is a relic from a time before even war let alone fortresses likely existed in Japan. Oshoro today is part of the city of Otaru, on its western fringe, 20 km from the city center and 60 km west of Sapporo. The Late Jomon period (circa 2400-1000 B.C.) was an age of northward migration. The north was warming, and severe rainfall was ravaging the established Jomon sites, primarily in the vicinity of today's Tokyo and Nagoya. Perhaps resettlement stimulated thought, for it coincided with a novel Jomon institution - the cemetery. "By devoting a special area to burials," writes J. Edward Kidder in "The Cambridge History of Japan," "Late Jomon people were isolating the dead, allowing the gap to be bridged by mediums who eventually drew the rational world of the living further away from the spirit world of the dead." The Oshoro Stone Circle was probably a cemetery. It was other things as well, but primarily that, says Naoaki Ishikawa, chief curator of the Otaru Museum, where many of the finds from around this stone circle can be viewed. It is one of about 30 Late Jomon stone circles scattered through northern Japan. In terms of size it ranks about midway between the smallest enclosures and the largest one at Oyu, Akita Prefecture, bounded by thousands of stones. No bones have been found to make an airtight case of the cemetery theory, but relatively few Jomon bones have been found anywhere, the acid in the soil claiming them long before the archaeologist's trowel can. 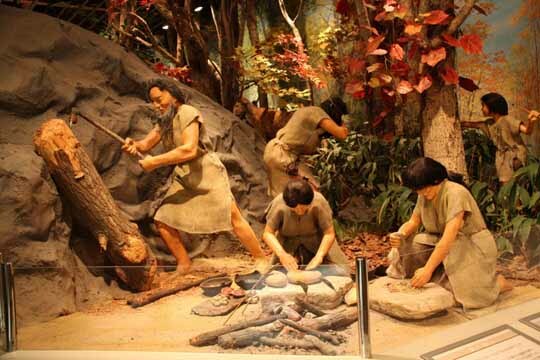 The first archaeologists at work in Japan were American and European. Their heyday was the late 19th and early 20th centuries, when Japanese curiosity regarding the remote past was satisfied by nationalistic myths accepted - on pain of harsh punishment as the Japanese government in the 1930s and '40s claimed control over thought - as fact. World War II ended, and, as though to make up for lost time, Japan plunged into archaeology. It became a passion, and remains one to this day. Historian William Wayne Farris, in "Sacred Texts and Buried Treasure," counts (as of 1998) some 4,000 archaeologists active in Japan - 20 times the number in Great Britain. A prewar pioneer in Japan was the Scottish archaeologist Neil Munro, whose "Prehistoric Japan" was published in 1908. He thought at first the stone circles might be astronomical observatories akin to Stonehenge in southwest England. Not so, asserts Otaru Museum's Ishikawa. The question remains open, but calendrical significance has yet to be established. "In my opinion," says Ishikawa, "the only thing Stonehenge and the Oshoro Stone Circle have in common is that they're both made of stone." What you see at Oshoro today - it's a wilder-looking spot than its physical proximity to the city would suggest, set among farmers' fields and hills overlooking the sea - is an oval rather than a circular expanse, 33 meters north to south, 22 meters east to west, bordered by granite rocks, the tallest of which are about hip-high. Some are rectangular, others rounded so smoothly you might think they had been sculpted, but no, "The rounded ones are called columnar joint stones," explains Ishikawa - "very common in the area, though some geologists say many of the stones were quarried at Cape Shiripa, 8 km away." The site is a shadow of what it was at its height circa 1500 B.C. - a victim, first of 19th-century Japanese pioneers reclaiming Hokkaido from the wilderness and eager to appropriate handy rocks as construction material; second, of well-intentioned but misguided "cleanup campaigns," the first in 1908 preparatory to a royal visit by the Crown Prince, the future Emperor Taisho. Why regard it as a cemetery? Partly, says Ishikawa, because of the large number of unidentifiable, and probably ritual, objects unearthed in the vicinity; partly because of the many tools found unbroken, suggesting grave goods; partly also because "graves are among the few things that would have justified the degree of effort involved. Constructing a stone circle is a major undertaking. You have to flatten the land, quarry the stones, transport them, lay them out. Only something of the highest importance could have taken people away from their daily hunting and gathering." Very likely also, he says, it was a market, a trading center for the exchange of tools, local foods, regional products, lacquer - and information, gossip. What would people have said to each other? In what language? Not Japanese, writes archaeologist Richard Pearson in the International Jomon Culture Conference Newsletter. Proto-Japanese, he says, only begins with the succeeding Yayoi culture. Ishikawa raises another possibility for the Oshoro Stone Circle - that it could have been a trash dump, which would explain the roughly 400,000 tool and pottery fragments so far unearthed there.